Last evening, a member of the FightHype community informed me of an avid reader of the site who was eager to ask undefeated pound-for-pound champion Floyd Mayweather some questions regarding his career. Evidently, after thoroughly enjoying our exclusive Mayweather After Dark series, the reader had a number of topics that they still needed some clarity on, so they compiled a list of questions for me to ask Mayweather the next time I spoke to him. Although some of them have already been answered, and others were based on inaccurate information, I contacted Mayweather to get his take on each and every one of the "burning" questions. Never one to disappoint a fan, or even those that hate, Mayweather gladly took time out of his busy schedule to respond and you don't want to miss what he had to say! BT: So Floyd, like I was telling you earlier, a reader of the site found these questions posted on some message board and emailed them to me. I guess, after watching the Mayweather After Dark episodes, somebody felt as though I should have asked you some of these burning questions. Some of them you've already answered, and others sound like they're simply misinformed, but I'll just throw them all out there. FM: No problem Ben. Go ahead. BT: Okay, here we go. First question. Floyd you said God won't let you lose. Why not just fight Pacquiao if you know God will not let you lose  or have you lost faith? FM: I don't remember ever saying God won't let me lose. If I ever did take a loss, I want a fighter to beat me fair and square. I stand on what I believe. That's why I said me and any opponent that I face has to take the random blood and urine tests. Not just Manny, but this goes for all future opponents, myself as well. Me and Shane did it for our fight. BT: Next question. The Pacquiao fight fell apart last time supposedly because your team said no negotiations took place. And then you said you decided you had lost the urge to fight and needed a vacation. What made you lose the urge if at one time as you claim you really wanted the fight and had your outfit ready to go? FM: Look, I agreed to everything that they asked from me during our actual negotiation. They said they would give random blood and urine tests, but they asked for a cutoff date. A month prior to the fight, they wanted a cutoff date. BT: I know you've already answered this next one before because I've asked you about it a couple of times. Why did you recently demand $100 million to fight Pacquiao if you already supposedly signed the previous contract which you obviously deemed monetarily acceptable? FM: I never asked for $100 million dollars. That's false. I said with my guarantee and on the back side, it's possible that I can make $75 to $100 million dollars in one night. BT: No clue where this one came from. Is it true or false that a deep-pocketed someone has loaned you between $10 and $20 million to pay off creditors? FM: It's false, but if it was true, I live my life the way I want to live it. I thought I live in a free country. I thought America was a free country. BT: As Pacquiao vs. Marquez has not been signed yet and you are the #1 target of Pacquiao and Bob Arum, what amount of cash exactly do you want to fight Pacquiao next, in October of this year? Would you accept the terms of the contract you supposedly signed? Would the 18-day random blood test cutoff you accepted for Shane Mosley be acceptable for Pacquiao too, or would you prefer 14 days? FM: How much I want for the Pacquiao fight is me and my team's business. And me and Shane never had a cutoff date. BT: You promised in one of your videos earlier this year that you would fight Pacquiao for your fans. When do you intend to keep that promise? FM: I don't think I promised nobody anything. I said the fight probably could happen in the future, but I never promised nobody anything. BT: You used to say, rather famously, "If it makes dollars it makes sense." But now you say it's not always about money? 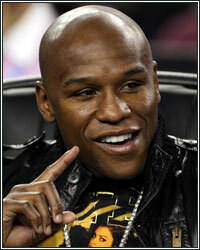 What, why and when did you change your philosophy and will you be dropping the moniker "Money Mayweather?" FM: It's about money, but my health is more important than money. BT: You said that you were going to take time off from boxing and devote your energies to cleaning up boxing and all sports of PEDS. What steps have you taken to clean up boxing, if any? FM: I'm making a step by letting the boxing world know that we need to start randomly testing the blood and urine of all of our fighters to clean the sport up because there's so much cheating going on in the sports world today. I took a step by randomly taking a test myself for the Shane Mosley fight. That was the first step. BT: Next question. I get the sense you are itching to box again. Who would you most like to fight next and why? FM: When I do decide to come back, I'm not sure who my opponent may be. The last time I took a two year break, I came back without a tune-up and beat the #2 pound-for-pound guy, which was Juan Manuel Marquez at that time. BT: Who ironically is going to be Manny Pacquiao's next opponent (laughing). Crazy! Anyway, next question. You said that you "don't want to watch a coward fight or a scared fighter fight". That means you believe there are cowards and scared fighters in pro boxing. Which pro fighters would you term as a coward or a scared fighter? FM: People are always saying Floyd Mayweather is scared and is a coward. I'm trying to find out why do people want to see me fight if I'm supposedly a coward and if I'm scared? BT: Okay, next one. If the Pacquiao fight can't be organized soon, have you thought about officially retiring from the sport? FM: Floyd Mayweather's career is not based on Manny Pacquiao. BT: You said boxing Pacquiao would be a "no-win situation." Can you explain how earning $50 million and beating the best fighter in the sport today, in what would be the biggest fight in boxing history, is a "no-win situation"? FM: I thought they just said I demanded $100 million dollars. Now how did they get back to $50 million dollars? BT: (Laughing) I know, man. Like I said, I think some of these questions were based on inaccurate information and taking some of the things you've said out of context. But hey, they can't say I didn't ask. Okay, last question. This one sounds like it came from someone who's not your biggest fan (laughing). Do you regret all your immature and classless behavior over the years which has resulted in your attaining a small fanbase, compared to the humble and beloved Manny Paquiao who is revered all over the world? FM: Only God can judge me. I'm a lot of things, but I'm not a cheater! BT: Ouch! Well there you go. That's all the questions they wanted me to ask you. I hope that clears up any confusion they may have had. That's all I got. I just wanted to touch base and get those questions answered real quick for those that try and say I'm just serving as a mouthpiece for you. And just to clear things up for any of you aspiring "journalists" out there, the Mayweather After Dark series was not meant to be some sort of hard-hitting, sit-down 60 Minutes type of interview. It was simply a mini-documentary about what it's like to hang out with Floyd Mayweather for an evening. For those members of the media who tuned in hoping to find out the answers to every single one of your burning questions, I apologize if you were under the impression that the mini-documentary was done in order to satisfy your needs. Unfortunately, I can't do your job for you, so in the future, you'll just have to get a hold of Floyd yourself. Thanks to the growing number of internet bloggers who call themselves reporters, there's a great deal of inaccurate information that's floating around out there. In previous interviews, like this one where all of the rumors were addressed, I've asked Mayweather the type of questions that I personally needed clarification on. In my opinion, some of the questions that I relayed to him today are a perfect example of what's wrong with "the media" in boxing. There are far too many misinformed people who try to pass themselves off as knowledgeable and credible sources, when the reality is that they're simply taking guesses and writing about their opinion as opposed to stating facts. That's just my two cents though.